Besides water, what can be used to clean the leaves? I've wiped them with water and cloth, but they are still ugly, not nice and shiny. "Take plants outdoors on a cloudy day (to avoid sunburn) and wash them down with a sprayer filled with diluted liquid dish soap. Rinse off leaves and let them air-dry. If spots appear on leaves, gently wipe them off. 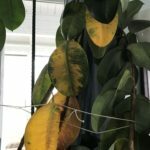 If you like the look of shiny leaves, lightly spray leaf polish or diluted summer oil on the top surface only; you don't need to wipe the leaves."